Founded in 1983 by actor Jeff Bridges and other celebrities, the End Hunger Network worked with the entertainment community to encourage, stimulate and create media projects, programs and events aimed at ending hunger. Through cooperative efforts with writers, directors, celebrities, media executives, nonprofit organizations, corporations, community and service groups, the End Hunger Network motivated U.S. citizens to participate in the growing movement to end hunger. Download the Toolkit for Ending Childhood Hunger in America. As of March 1, 2019, the End Hunger Network ceased operations as a 501(c)3 nonprofit organization and will no longer accept contributions. ​about hunger in America and the world, and making the end of childhood hunger a national priority. Together we did some innovative stuff that made a difference! Broadcast live on April 25, 1983 in Los Angeles and San Diego markets, and subsequently in Houston and Palm Springs. ​The three-hour television broadcast END HUNGER TELEVENT featured performances by Burt Lancaster, Gregory Peck, John Ritter, Jack Lemmon, Valerie Harper and many others. The innovative presentation debunked the prevalent myths about hunger (scarcity, inevitability, no solutions, and the belief that individuals can’t really make a difference), updated the audience with the latest findings about hunger and identified specific actions that individuals could take. Enthusiastically supported by many private voluntary organizations working directly to battle the effects of hunger, the creators of the Televent also developed a volunteer clearinghouse, the Action Support Center for Ending Hunger. Under this umbrella organization, more than 150 organizations identified opportunities for volunteers. When viewers of the Televent called in, they were sent information describing these opportunities and connecting them with appropriate organizations. The End Hunger Televent was the first attempt to present the issue of hunger in a way that avoided showing demeaning pictures of starving children, yet spoke clearly and firmly about the problem. At the same time, individual action was encouraged so that Americans could become partners with the poor as they worked for self-reliance and independence from hunger. The End Hunger Televent was awarded the Silver Medal for Public Service Programming at the New York International Film and TV Festival in 1983. After the Televent, the Action Support Center for Ending Hunger and the Los Angeles World Hunger Event (an organization that funded and produced the Televent) merged to become the End Hunger Network, to use the media to stimulate the increased awareness and involvement which is needed to enact solutions to hunger. ​The LIVE AID concert was a landmark event for the campaign to end hunger and brought a new consciousness to the world in 1985. This largest media event ever – reaching an estimated audience of 1.5 billion people around the world – provided a unique opportunity to educate massive numbers of people about ending hunger. Leading performers at Live Aid included: Ozzie Osbourne, Sting, Phil Collins, Madonna, Elvis Costello, The Four Tops, BB King, Crosby Stills & Nash, Bob Dylan, U2, The Beach Boys, Queen, David Bowie, Mick Jagger, The Pretenders, The Who, Elton John, George Michael, Tom Petty, Kenny Loggins, Eric Clapton, Led Zepellin, Patti LaBelle, Hall & Oates, and Tina Turner. The End Hunger Network was asked by Worldwide Sports and Entertainment, the producers of the U.S. portion of the concert, to write and produce all the educational and fundraising materials for this 16-hour global event. In addition, the End Hunger Network was responsible for writing the script used by performers and television hosts who anchored the concert. Prior to the concert, the End Hunger Network featured actress Valerie Harper and Dr. Djibril of the United Nations Development Programme in a satellite teleconference, briefing over 500 broadcasters who would be involved with the concert worldwide. This briefing provided the broadcasters with current data about hunger, especially in Africa, and coached them on how to talk about the issue. In addition, back-up material was sent to all broadcasters in each of the 60 nations participating in the broadcast. We can end the famine in Africa and hunger in the world. The task ahead is not only relief, but also recovery and self-reliance among the developing nations. Efforts to combat hunger are succeeding. The End Hunger Network’s mission was to communicate these messages in the three-minute spots allotted for every ½ hour in the 16-hour show, and to do it in such a way that all four messages could be delivered effectively every two hours (the average time it was estimated that individuals would watch the show. These spots within the broadcast featured world and U.S. leaders, including Bishop Desmond Tutu, former President Jimmy Carter, and Prime Minister Rajiv Gandhi of India. Actress Sally Field and announcer Casey Kasem were featured in the EHN-produced fundraising spots that are credited with raising funds from the U.S. audience. Twelve television satellites broadcast around the world (including the Soviet Union), and simultaneous telethons were held in some 30 nations, including Australia, Japan, West Germany and Canada. The response to Live Aid was unprecedented, raising over $125 million. According to figures released by the Live Aid Foundation in January 1986, 60% of the money raised has gone to long-term development programs (projects that aimed to assist the hungry and impoverished people of Africa to work towards self-sufficiency), 20% had been provided for emergency relief services, and 20% for transport – equipment and programs to move food to where it was most needed during the famine crisis. 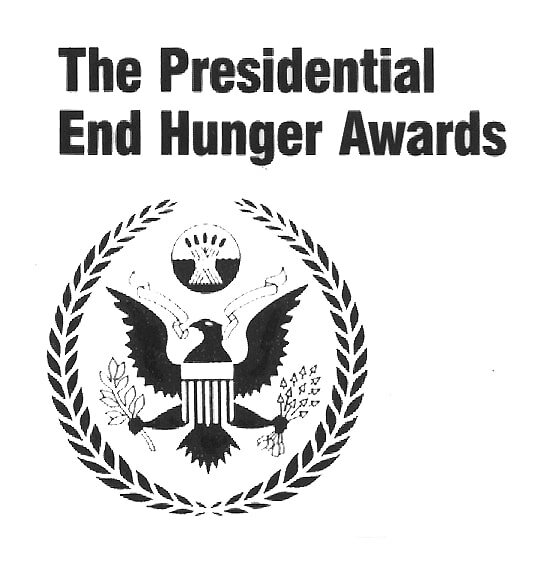 The PRESIDENTIAL END HUNGER AWARDS honored United States citizens and institutions that have made significant contributions to the ending of hunger. The U.S. Agency for International Development sponsored the awards program, which was administered by the End Hunger Network. Nominations for the awards were received from around the world, and reviewed by a panel of judges composed of leaders in the hunger awareness community and representatives of the awards categories. The panel’s recommendations were forwarded to the Administrator of USAID, who submitted them to the President for final selection. Award recipients were flown to Washington DC for a formal presentation of the awards at a special White House ceremony. The ceremony was usually followed by a press conference, interviews with the media and a reception honoring the recipients. Categories for exceptional commitment to ending hunger were designated for the Presidential End Hunger Awards. These include Lifetime Achievement, Individual Achievement, Organization, Educator/Scientist, Corporate, Government/Legislative, Media/Communications, Celebrity and Special Recognition. An award may not necessarily be made in each category every year, and more than one award may have been given in a single category. The Awards are truly an honor for Americans who have been selected by the President because of their accomplishments toward the end of hunger. They are the “national hunger heroes” chosen in a particular year, recognized as models for the type of citizen action that will help end hunger. The awards program sought to increase public understanding of this problem and its solutions, as well as to inspire further committed action to ending hunger. PRIME TIME TO END HUNGER brought together the three major TV networks for the first time to air special episodes of primetime TV shows. Episodes of top shows dealt creatively with hunger, homelessness and volunteerism. Through their favorite shows, viewers were informed about the issues and urged to get involved. Part of the design of the initiative was to have one of the stars of each of the shows invite viewers to volunteer in their local communities. Viewers were invited to make a phone call to request a brochure that gave information on how to volunteer effectively – the first “consumer’s guide” to volunteering. AT&T, MCI and Sprint cooperated for the first time to provide national coverage of interactive voice response units to handle the expected volume of calls. The End Hunger Network developed a national database of local volunteer opportunities so the brochure could be personalized to every recipient’s zipcode with a local phone number. The End Hunger Network enrolled a number of national partners who promoted the initiative among their members and supporters, including: Volunteer-The National Center, United Way of America, American Red Cross, Catholic Charities, Council of Jewish Federations, National Council of Churches and the Salvation Army. The initiative was launched at a White House Rose Garden ceremony, featuring President George H. Bush and the heads of ABC, NBC and CBS. Polaroid Education Program developed a curriculum to assist teachers in developing lessons around helping others and improving local neighborhoods. Other corporate sponsors included Archer-Daniels-Midland, Sony Corporation of America, A&M Records and Films, Ampex Corporation, Webcraft Technologies, Atlantic Video and Land O’Lakes. The production companies of the individual shows (Columbia, MGM/UA, Viacom, Universal, Walt Disney and Warner Brothers) each contributed to advertise the initiative in People magazine and newspapers in the largest TV markets. HIDDEN IN AMERICA, a feature film produced by Showtime Original Pictures, was created and developed by the End Hunger Network in 1996. It was nominated for three Emmy Awards, one Golden Globe Award, two Golden Satellite Awards, one Screen Actors Guild Award and one Writer’s Guild of America Award. Golden Globe Award-winner Beau Bridges is an unemployed blue-collar working fighting to save the family he loves in this deeply inspiring film. After losing both his wife and his assembly line job, Bill Januson (Bridges) suddenly finds he’s unable to put food on the table for his two young children. But when a sympathetic doctor (Oscar nominee Bruce Davison) offers to help, Bill’s stubborn pride keeps him from accepting. Then his 11-year-old son tries to take on the role of bread-winner, and the near-tragic result compels Bill to make the life-affirming decision to reach out for the compassion his family needs to survive. Also featuring Oscar winners Jeff Bridges and Frances McDormand, Hidden in America is a poignant, powerfully moving story of courage, sacrifice and the dignity of the human spirit. An educational curriculum was developed to accompany distribution of this film to classrooms. FAST FORWARD TO END HUNGER, a three-year joint venture by the End Hunger Network and the Video Software Dealers Association, was an in-store fundraising and awareness program specifically designed to raise funds for hungry children in local communities. Thousands of video retailers across America, major and independent film companies, home video distributors, duplicators and other industry businesses participated in this unprecedented program. At no cost to participating retailers, 100% of all funds raised went directly back to the community in which they were raised. A complete in-store merchandising kit was provided free, including a counter display, shelf talker, window cling, bag stuffer and campaign certificate. Sample press releases and celebrity public service announcements on in-store loops and major video releases helped let customers know about the campaign. More than $3 million was raised by the campaign and was distributed to Second Harvest (now Feeding America) food banks within the communities where retailers participated. The End Hunger Network and the Center on Hunger & Poverty developed a plan for a national media initiative that would support state-by-state action to end childhood hunger by raising awareness and mobilizing action through education, fundraising events and coalition-building. The Entertainment Industry Foundation obtained the support of Unilever Bestfoods as a founding sponsor. The goal of HUNGER FREE AMERICA was to make ending childhood hunger a national priority, focusing on the expansion of breakfast, lunch and dinner programs in public schools, and raising necessary funds to feed at-risk families. Experts agree that hunger in America can be ended if it becomes a national priority. Our nation has the resources and the proven state and federally funded programs to end hunger. What's needed is the popular will and political leadership. Hunger Free America was a concentrated effort, working with statewide coalitions (including celebrities born in those states, governors’ offices, nonprofit groups, churches, corporations and other leaders), to bring about the kinds of needed changes required to assist families of hungry children. * Note: sales of these products no longer generate contributions to charity.